The Battle for Middle-Earth Begins! The Fellowship has broken, but the quest to destroy the One Ring continues. Frodo and Sam must entrust their lives to Gollum if they are to find their way to Mordor. As Saruman's army approaches, the surviving members of the Fellowhip, along with people and creatures from Middle-Earth, prepare for battle. The War of the Ring has begun. $62.007 million on 3622 screens. Since this package gives us the third DVD release of The Lord of the Rings: The Two Towers, I won’t spend a lot of time in a discussion of the movie. The first set presented the 179-minute theatrical cut of the flick, while the second package featured the 223-minute extended take of Towers. If you’d like to read my full thoughts on the two editions, have a cow and click the links above. In short, while not quite as terrific as its predecessor, Two Towers provides a solid flick on its own. It seems likely to gain in stature when the trilogy ends, but it still works quite nicely in the meantime. The longer version of the film seems more readily comprehendible and provides a clearer telling of the tale. I thought the added clips acted as a nice way to flesh out the story. None of the material was essential, but the segments allowed the flick to breathe a little better and made it a more satisfying experience. 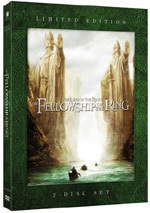 The Lord of the Rings: The Two Towers appears in an aspect ratio of approximately 2.35:1 on this double-sided, dual-layered DVD; the image has been enhanced for 16X9 televisions. I anticipated a fine visual presentation, and this transfer of Towers more than lived up to my expectations. Fellowship gave us a pretty restricted palette, and the darker atmosphere of Towers meant its hues were even more subdued. The first flick featured some settings with warm tones such as the shire or the elf lands, but Towers seemed much cooler overall. Even the greenery of the Ent locales looked a bit pale. I didn’t regard this as a problem, though, since the DVD clearly replicated the movie’s intended palette. The colors were appropriately vivid when necessary and seemed accurately depicted. Black levels also came across well. Dark shots demonstrated good depth and clarity. Low-light shots were nicely displayed and seemed clear and adequately visible. Shadow was clean and tight. Given the darkness of so much of the film, those components became especially important, so their high quality was an important factor in the success of the transfer. Overall, the image of The Two Towers appeared very strong. The extended edition of Towers integrated the new 44 minutes of scenes neatly, and I never noticed any disruptive or awkward edits. The visuals appeared consistently positive for those segments, so I didn’t detect any decrease in quality. The elements flowed smoothly and concisely. If you compare my comments above to those of my review for the theatrical cut of The Two Towers, you’ll note that they’re identical. Given that fact, why did I increase my grade from an “A” for the two-disc version up to an “A+” for the extended edition? Because it seemed too flawless for me not to give it that mark. I almost never award “A+” ratings for live-action flicks, but the extended version of Towers looked so amazing that I felt it earned the ultimate honor. The special edition accorded extra bitspace for the transfer, and that seemed to make a difference. This set presented the movie in a fantastic way that appeared exceedingly smooth and dynamic. While the original DVD looked great, this one came across as just a little tighter and transparent. I saw no moments that gave me even the slightest hint of concern, so I thought Towers deserved an “A+” for its fantastic transfer. I also felt very pleased with the Dolby Digital EX 5.1 soundtrack of The Two Towers. The track featured the same strengths of the audio for Fellowship but lacked that mix’s moderate weaknesses. Fellowship suffered from rather overcooked bass response. Low-end elements blasted off the charts and became something of a distraction. Happily, that didn’t occur for Towers, which presented very good bass. The rest of the Fellowship mix seemed excellent, and Towers replicated that success. The soundfield appeared very active and involving. All five channels presented lots of material that kept the viewer at the center of a realistic and immersive world. Elements seemed appropriately placed and they blended together well. Flying creatures soared from location to location accurately, and other pieces popped up in their proper places too. The whole thing meshed together quite nicely, and the piece worked swimmingly. Not surprisingly, battle sequences were the most impressive, but the entire package seemed strong. Audio quality equaled the positive nature of the soundfield. Speech was natural and distinctive, and I detected no issues connected to intelligibility or edginess. Music sounded bright and vibrant, as the score presented rich and full tones. Effects came across as accurate and concise. No problems with distortion appeared, and these elements were clean and broad. Bass response seemed excellent. The low-end remained tight and rich. I found much to like in the terrific soundtrack of The Two Towers. If you compare the comments above to those in my review of the four-DVD Tower, you’ll find they’re identical. That’s because I thought the picture and audio of this new release were the same as what that 2003 release presented. It looked and sounded great then, and it looks and sounds great now. When we head to the extras of this “Limited Edition”, we get a Behind the Scenes documentary. Filmmaker Costa Botes made this one-hour, 46-minute and 16-second program. We find notes from director Peter Jackson, extras wrangler Josie Leckie, director of photography Andrew Lesnie, camera operator Richard Bluck, armour weapons standby John Harding, greens master Brian Massey, co-producer Rick Porras, designer/sculptor Daniel Falconer, senior machinist/engineer Dominic Taylor, animation supervisor Randall William Cook, stunt performer Steve Reinsfield, extras casting Miranda Rivers and Victoria Cole, painter Brett Larsen, carpenters Geoff Goss and Ross Hoby, supervising unit location manager Richard Sharkey, 2nd AD Marc Ashton, stunt performers Mana Davis and Sala Baker, 2nd unit director Geoff Murphy, boom operators Eoin Cox and Corrin Ellingford, on set art director Simon Bright, camera operator Peter McCaffrey, motion control operator Henk Prins, previsualisation supervisor Christian Rivers, digital surveyor Nick Booth, stable foreman Lee Somervell, gaffer David Brown, set finishing supervisor Kerry Dunn, on set art director Joe Bleakley, effects technician Peter Zivkovic, on set prosthetics makeup Tami Lane, 3rd AD Chris Husson, Weta Workshop’s Richard Taylor, effects technicians Darryl Richards and Scott Harens, stunt rigger Paul Shapcott, New Zealand stunt coordinator Kirk Maxwell, swordmaster Bob Anderson, medic and safety officer Andy Buckley, supervising art director Dan Hennah, conceptual artist Alan Lee, Gimli scale double Brett Beattie, and actors Dominic Monaghan, Billy Boyd, Andy Serkis, Bernard Hill, Brad Dourif, Elijah Wood, Orlando Bloom, Sean Astin, Miranda Otto, and Viggo Mortensen. The program presents images from the shoot. 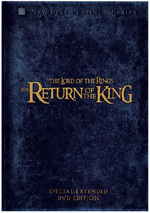 These cover locations and dealing with the elements, sets and miniatures, the design and creation of Treebeard and Gollum, stunts, horse-riding and action sequences, extras and location concerns, photographic complications, audio, integrating computer creatures into the action, various effects issues, and other details. Look at this show less as a documentary and more as a production diary. All of the interview footage comes from the set along with the behind the scenes bits. This means we get nice glimpses of different elements but the program doesn’t add up to a conclusive examination of the movie’s creation. Don’t take that as a criticism, though. The documentary is always fun and engaging as it covers a nice mix of topics. I like this kind of “fly on the wall” material and find a lot of good material on display here. 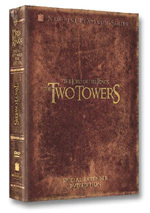 The big question for fans will be in this “Limited Edition” of The Two Towers offers anything truly new. Short answer: yes, but only to a minor degree. The set allows us to alternate between the theatrical and extended cuts all on the same disc, and the behind the scenes documentary presents some nice shots of the production. The program for Towers surpasses that for Fellowship because it concentrates more heavily on the action seen on the set. The latter tossed in more material about design and development, but since those details were sketchy, they didn’t add much. The Towers documentary works better since it sticks more heavily with shots from the set. That said, I don’t know how much fans who watched the extras with the four-DVD will gain from this program. We see some fun elements but I can’t say we really learn anything new about the production. As a fan, I think there’s a lot of enjoyable material on display; it simply doesn’t teach us much that we don’t already know. 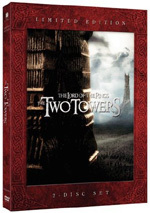 I continue to recommend The Two Towers as a movie and a DVD. This “Limited Edition” offers picture and audio on a par with prior releases, and it includes some unique extras. The big question: who – if anyone – should buy this set? Die-hard fans will undoubtedly want it, but I find it tough to recommend for others. If you don’t care about extras and want both the extended and theatrical cuts of the film, it’s a good acquisition. I definitely prefer the 4-DVD extended release, though; it’s the set of choice. I think that if you would rather have the theatrical cut, the original set is a better buy since it’s much cheaper. I like the “Limited Edition” on its own merits but think it’s the least useful of the three releases to date.